Jonathan Daniel Hamm is an American actor, director and television producer born on March 10th, 1971 in Saint Louis, Missouri. Her mother died when he was 10 years old. 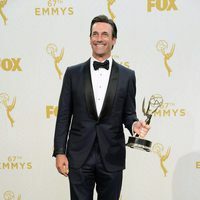 Hamm began acting at school but he didn't considered being an actor as a career until he was chosen to perform in a college production of William Shakespeare's 'A Midsummer Night's Dream'. After he graduated and began teaching interpretation for a while, he decided to travel to Hollywood to visit his friend Paul Rudd. He moved to Los Angeles in 1995. He worked as a waiter while he was trying to be chosen on the auditions. His first role was on the tv series 'Providence' in 2000. After that he debuted on the film industry in a small role in 'Space Cowboys'. 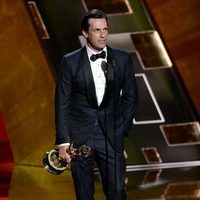 He gain main recognition when he was selected to play Don Draper, the lead character on AMC's 'Mad Men' in 2007. 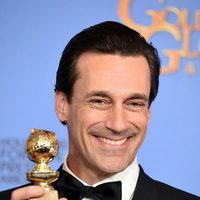 He won a Golden Globe Award for Best Actor in a Television Series- Drama in 2008 and also a Primetime Emmy Award for Outstanding Lead Actor in a Drama Series in 2015. 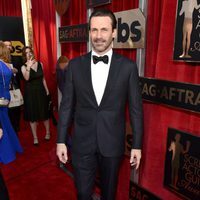 Jon Hamm has vitiligo Jon Hamm quit smoking at 24. While he was playing Don Draper he smoked herbal cigarettes that didn't contain tobacco or nicotine. 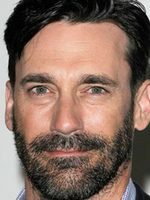 When Jon Hamm worked as a highschool drama teacher, one of his students was Ellie Kemper from 'Unbreakable Kimmy Schmidt's tv series.